puzzle games, Nurikabe. 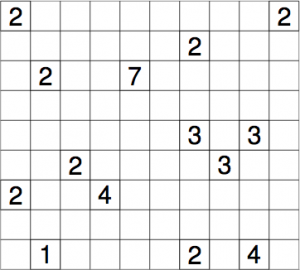 It has also been called as the cousin of Sudoku. Nurikabe is an entertaining yet challenging puzzle game which will keep your brain sharp all day long. In this page you will be able to find not only Nurikabe puzzle games but also printable nurikabe puzzles, its rules and even strategies on how to become the best Nurikabe player. Nurikabe (hiragana: ぬりかべ) is a binary determination puzzle named for Nurikabe, an invisible wall in Japanese folklore that blocks roads and delays foot travel. Nurikabe was apparently invented and named by Nikoli; other names (and attempts at localization) for the puzzle include Cell Structure and Islands in the Stream. Each numbered cell is an island cell, the number in it is the number of cells in that island. Each island must contain exactly one numbered cell. There must be only one sea, which is not allowed to contain “pools”, i.e. 2×2 areas of black cells. As all the other pure-logic puzzle games, a unique solution is expected at the end of the game. Please also note that randomly assigning numbers will result in an unsolvable Nurikabe game.